Each antibody is developed in-house and rigorously tested for specificity and sensitivity in western blot, immuno-fluorescence, immuno-precipitation and ELISA. For more information, click on the appropriate group of antigens below. At Cytoskeleton, we understand that many antibodies are suspect and have uneven quality. Each antibody goes through a rigorous validation process to give scientists the best picture of an antibody’s performance in different situations. An example of typical validation tests that are performed are described below. Western blot gives great information about specificity (the ability to detect only the antigen), and some information about the affinity. If the antibody can detect one antigen band in a lane which is loaded with 50 µg of extract then it is considered specific. If it can detect 1ng (50 femto-moles) of antigen using chemiluminescence detection it is considered high affinity. Figure 1. 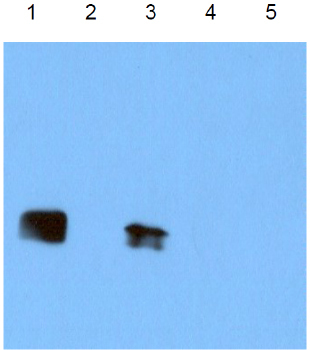 Western blot analysis of anti-Rac1 antibody (Cat. # ARC03). The detection of 25 ng His-Rac1 ( lane 1), His-Cdc42 (lane 2), 50 µg of platelet extract (lane 3), His-Rac2 (lane 4) and His-Rac3 (lane 5). ARC03 does not cross-react with Rac2, 3 or Cdc42. The blot was probed with a 1 µg/ml (1:500) dilution of ARC03, 30s exposure time. Immunofluorescence in situ (IF) and its counterparts immunohistochemistry (IH), fluorescence activated cell sorting (FACS) and high content screening (HCS) are performed by staining live or fixed cells or tissues with a fluorescent or colorimetric marker. The importance of this technique to characterize antibodies is to confirm that the reagent can detect the antigen in its native environment. An antibody may detect the native conformation (e.g. with paraformaldehyde fixation) or denatured antigen (e.g. with methanol fixation) and hence these aspects must be presented in the datasheet. Another consideration is that the antigen may be masked by another molecule e.g. protein or DNA, and hence may not work in this application unless a disrupting agent (e,g, methanol, detergent or chaotropic agent) is added first. A pre-requisite of this technique is to be sure the Western blot is giving just one band in a lane containing cell extract. Figure 2. Immunofluorescence images of mouse Swiss 3T3 cells stained with Anti-Tubulin polyclonal antibody (Cat. # ATN02). Swiss 3T3 cells were grown to semi-confluency and fixed with methanol. 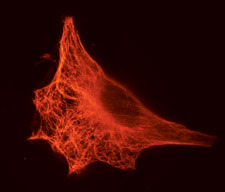 Immunofluorescence staining using 2.5 µg/ml (1:200 dilution) ATN02 antibody is shown (red). The primary antibody was detected with a 1:500 dilution of anti-sheep rhodamine conjugated antibody. DNA (blue) was stained with 100 nM DAPI in PBS. Photograph was taken with a 100X objective lens. ELISA is a quantitative technique to determine the amount of antigen in a sample. The technique is important in determining the affinity of an antibody to an antigen. Usually high affinity reagents have Kd’s = 10-9 M or higher. Immunoprecipitation (Ippt) is a useful technique to determine binding partners in an extract. It is particularly in signal transduction research where regulated binding partners may differentially occur in the pellet sample when activated or de-activated. The antibody is usually bound to a bead and used as an affinity matrix to pullout the antigen and any associated proteins. Figure 4. 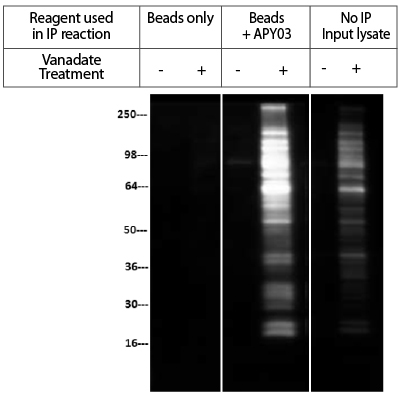 Immunoprecipitation of pervanadate-treated lysates from NIH3T3 cells using APY03. NIH3T3 cells were either treated (+) or untreated (-) with H2O2/orthovanadate (100 µM for10min). Cell lysate was prepared in RIPA buffer and 200 µg of lysate per reaction was used forimmunoprecipitation of tyrosine-phosphorylated proteins. APY03 was first bound to protein G beadsand then incubated with cell lysate. For bead only control, cell lysate was incubated with protein Gbeads without APY03. 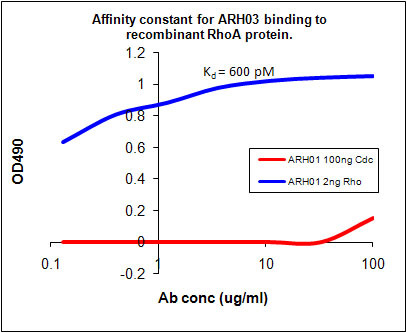 Western blots of immunoprecipitated proteins were developed using APY03 at1:500 dilution and CleanBlot (Thermo Scientific, #21230) as secondary antibody. No IP input lysaterepresents the signal from 5% of H2O2/orthovanadate treated or untreated NIH3T3 lysate. As shownin Figure 2, APY03 was able to enrich a wide range of tyrosine-phosphorylated proteins from NIH3T3cells treated with H2O2-activated orthovanadate. No signal was detected with Protein G bead controlwithout APY03.